Greek Dress at the Hellenic Centre, London – 4 February until 2 March 2014 – with Bent references! Marylebone, in Central London, might seem an unlikely place for an exhibition of Greek costume, but it is the home of the Hellenic Centre, a focus for philhellenes and London’s Greek community.From 4 February until 2 March 2014, there was a rare opportunity to see an impressive range of Greek dress outside its native land. As part of the event (on Friday 28 February, 7.15pm), Ann French, Textile Conservator at the Whitworth Art Gallery, the University of Manchester, used selected embroideries from the 1914 pioneering embroidery exhibition at the Burlington Fine Arts Club in London, to trace their individual collecting histories and reveal the different contexts, interpretations and values placed on them within UK based collections and museums. 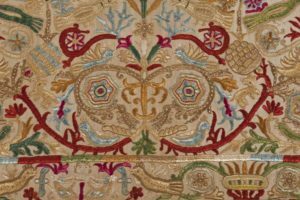 This exhibition, which drew on the leading collections of the day, primarily from the archaeologists R M Dawkins & A J B Wace, of Greek Embroideries displayed, for the first time in the UK, historic Greek Embroideries as an art form. The exhibition included several pieces from Mabel Bent’s collection and Ann refers to them in the last five minutes or so of her talk in a fascinating account of how, on Mabel’s death, one of her Karpathos frocks found its way back to Greece! 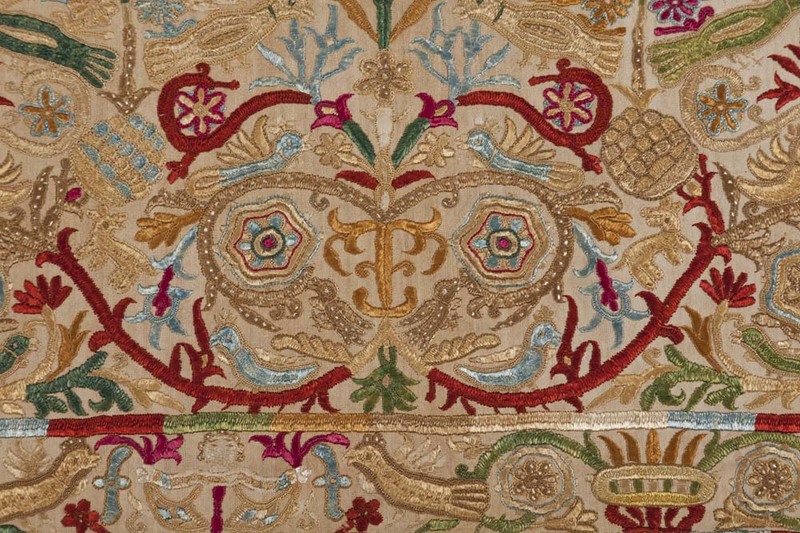 The talk was called “Old Embroideries of the Greek Islands and Turkey: An Exhibition at the Burlington Fine Arts Club 1914: A Celebration and Commemoration”, and can be seen on the video linked here, entitled ‘Patterns of Magnificence’.